Sergeant Kooperman is a large, overweight, strict and sadistic drain sergeant who lives in Brooklyn, where he teaches at the Brooklyn Plumbers Academy. Coincidentally, his voice is exactly the same as King Koopa's. In The Super Mario Bros. Super Show! 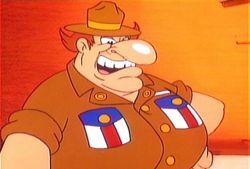 episode "Plummers Academy" Sergeant Kooperman appears in an extended flashback sequence in which Mario recapped the events of how he and Luigi became plumbers. When Mario and Luigi first arrive at the academy, they enter Kooperman's classroom, where the sergeant takes an immediate disliking to the two of them, due to their unimpressive physiques like their short statures and their fear of him. He tells them that they have the wrong stuff, which surprisingly, Mario seems to take to heart a bit. Sergeant Kooperman puts Mario and Luigi through several back-breaking rigorous tests, the first of which involves the brothers to each carry a bathtub up the fire escape of a tall building. Unimpressed with their time, Sergeant Kooperman forces the two of them to take the tubs back down and start all over again without even permitting them to take a brief break. For their next test, Sergeant Kooperman makes Mario and Luigi each unclog a sink within a ten second time limit. By accident, some of the sludge that Mario and Luigi are unclogging splashes onto Sergeant Kooperman's face. Sergeant Kooperman is angered at Mario and Luigi even more, and he puts the two of them on K.P. (Killer Plumbing). As part of their K.P. Mario and Luigi are then forced to dig a very deep hole using shovels. When Mario requests a glass of water, Kooperman rejects the request, and puts Mario and Luigi on a different assignment; fitting a mess of assorted pipes together in twenty minutes with no wrenches. After Mario and Luigi attempt to put the pipes together, Sergeant Kooperman puts them to another test by blasting water at them with a hose; the water causes their pipes to collapse, trapping them inside, with the water level rising. Sergeant Kooperman refuses to help "guys with the wrong stuff", and makes things worse by tossing more pipes on top of them, telling Mario and Luigi that they will never get to be plumbers. After Mario and Luigi get out of the pipes, they leave Sergeant Kooperman, as well as the academy, and consider a different career option. Meanwhile, Sergeant Kooperman goes on a plumbing job of his own, where he kindly agrees to unclog a woman's sink. When Sergeant Kooperman goes outside to pick up a sack of Drain Buster, he accidentally picks up a sack of concrete that some nearby construction workers need instead. Pouring the concrete down the sink, Sergeant Kooperman assumes that the problem is coming from outside, where two of the construction workers question him as to why he is pouring their concrete down a manhole. This action clogs the sewers, which in turn causes the streets to start flooding, just as the U.S. President and the Russian President are being driven around Brooklyn. Although Sergeant Kooperman is never seen again, Mario and Luigi manage to unclog the cement themselves, saving the two presidents from being washed away. For their bravery, the President awards Mario with a Golden Plumber's Helper, and Luigi with a Golden Wrench. It is possible that his actions were found out and he was fired from the academy. In addition to having the same voice as King Koopa, Sergeant Kooperman has a few other things in common with him. He has the word "Koop" within his name, he hates Mario and Luigi right off the bat, and he has a cruel personality. Sergeant Kooperman is a parody of Gunnery Sergeant Hartman from the 1987 film, Full Metal Jacket because of his strict, sadistic, loudmouth personality.